Wishart is a suburb in the City of Brisbane, Queensland, Australia. Wishart is 14 kilometres (8.7 mi) south-east of the CBD. Bulimba Creek flows through the suburb. Newnham Road in Wishart was originally part of a stock route from farming areas south of Brisbane to the Cannon Hill saleyards. The land beside Newnham Road was eventually developed into small farming blocks, reducing the width of the stock route to that of a normal road, but it was still used occasionally by travelling stock until the 1960s. 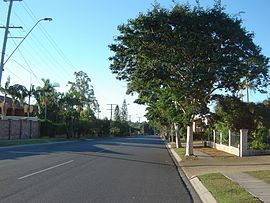 As Brisbane grew the suburb was subdivided for residential blocks. The Brisbane Adventist College, Mansfield State High School and Primary Schools are located near Wishart. In the 2011 census, the population of Wishart was 10,460, 52.4% female and 47.6% male. The median age of the Wishart population was 37 years, the same as the Australian median. 67.6% of people living in Wishart were born in Australia, compared to the national average of 69.8%; the next most common countries of birth were New Zealand 3.9%, England 2.8%, China 1.7%, India 1.6%, South Africa 1.3%. 74.7% of people spoke only English at home; the next most common languages were 3.4% Cantonese, 2.2% Mandarin, 2.2% Greek, 1.3% Hindi, 1.1% Korean. ^ Australian Bureau of Statistics (27 June 2017). "Wishart (State Suburb)". 2016 Census QuickStats. Retrieved 14 April 2018. ^ "MacGregor Ward". Brisbane City Council. Brisbane City Council. Retrieved 12 March 2017. ^ "Wishart - suburb (entry 43702)". Queensland Place Names. Queensland Government. Retrieved 27 June 2017. This article about a place in Brisbane is a stub. You can help Wikipedia by expanding it.